A very happy puppy ... and her equally happy human. The puppy is Lucy, a little smooth-coat tri-color border collie. She's very smart, and (for her age) unusually confident. Her human is A. J. 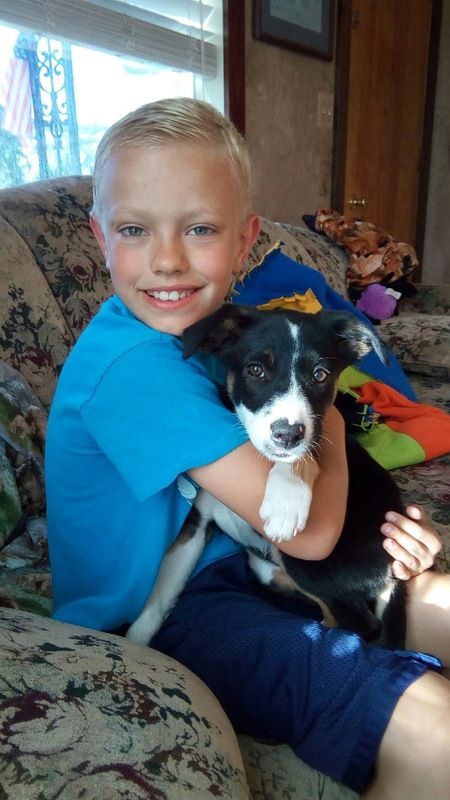 – Michelle H.'s youngest son, and a few weeks ago the thing he wanted the most in his life was a puppy. He's been completely devoted to Lucy for several weeks now, and he's working with Debbie to learn how to train her. He wants to run her in agility! I spent much of this morning painting – touch-up work, mainly on trim. We had a lot of places where the trim had taken some hits, most likely from when we've moved furniture or other big things inside the house. It's easy work, but a bit tedious. After that I did my “water chores”: added salt to the water softener, changed the sediment filters (we have two in series), and changed out the ultraviolet bulb in our water purifier. That last bit is an annual ritual – not really very difficult, but because I do it so infrequently I have to re-learn what to do each time. :) I imagine I'll be able to keep changing the filters and that UV bulb for quite a few more years before I'm too feeble – but I'm more concerned about the salt. It comes in 40 pound bags that have to be carried from the garage down to the basement mechanical room, then lifted waist-high and dumped into the saline tank of the water softener. There will come a time when those things are beyond me, perhaps not so many years from now. The only solution I can come up with for that problem is to hire a local kid to come do it for me! Paradise ponders: weird switches, doorbells, dusty sunrises, and fine wine edition... A while back, Debbie found a really pretty doorbell switch (with a brightly colored cat background). Our house has no doorbell wiring between the front door and the place we'd like a bell, so a conventional 24 VAC doorbell is impractical. Someday I'd like to build a doorbell that actually uses mechanical bells (I love the sound of them! ), but for now we decided to get one of the bazillion electronic doorbells – the kind with a radio transmitter behind the doorbell switch and a receiver you plug in the wall. I figured it wouldn't be very hard to scab the pretty switch Debbie found onto the transmitter inside the plastic electronic doorbell switch enclosure. It was harder than I expected. :) When I first wired the new switch into the transmitter, it just continuously transmitted: pushing the switch did nothing and the doorbell rang continuously. Not good. So I disconnected the pretty switch and connected it to my multimeter, which has a “beep” mode for detecting closed circuits. That did something really weird: when first connected to the switch, it made no beep (as you'd expect). When I pushed the switch, it beeped (again, as you'd expect). But then when I let go of the switch, it kept beeping – most definitely not what you'd expect. It acted as though there was some kind of active logic inside a simple SPST, NO switch. WTF? That bizzaro behavior prompted me to do a little more careful testing. With the meter in normal resistance measuring mode, I saw that the switch had 0.15 ohms resistance when pushed, but 63.5 ohms when released – not the behavior I'd expect in a simple switch! The resistance measured the same with the leads in either polarity, so it was a simple resistance, not a diode. I finally figured out that the switch had an incandescent lamp in it. I tested it at 24 VAC, and got a dim glow – perfect for spotting a doorbell in an unlit doorway at night. There was no indication on the packaging of the existence of that lamp, so it caught me completely by surprise. Fortunately the lamp was wired across the switch terminals with some barely visible wire; a couple of snips and the lamp was gone. After that, the switch worked as expected, and now we have a doorbell! The sunrise this morning looked like it was filtered through dust, or possibly smoke. An even orange glow covered about 120° of the horizon, quite odd looking. Sunspots... 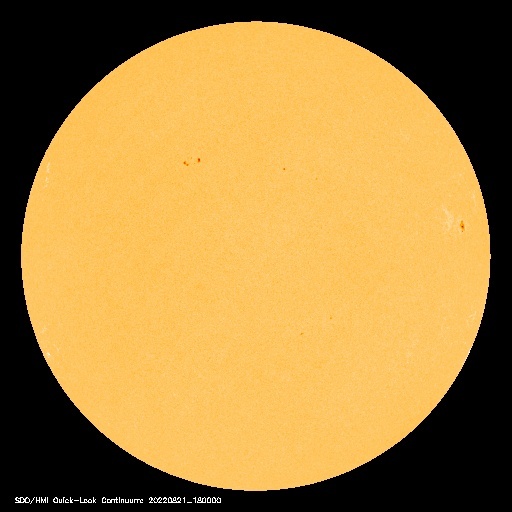 Yesterday I read a mention somewhere that there were big sunspots facing the earth. So I got out my eclipse binoculars and took a look – and sure enough, I could see three gigantic sunspots right near the center of the sun's disk. The image at right was taken this morning by the SOHO satellite, but it's pretty close to what I could see in the binoculars. The three big ones were easily seen, and I also saw a hint of the one off to the right. The smaller one to the left I couldn't see at all. When I was a wee lad, I built a telescope (a 6" diameter hand-ground Newtonian reflector on an equatorial mount made from galvanized pipe!). It was a terrible telescope by any reasonable standards today, because it's now possible to buy superb mass-manufactured optics at very low prices. But for its time (and most especially for its nearly non-existent budget! ), it was actually reasonably good. I had a simple solar viewer for that telescope: just a piece of white cardboard that I could project an image onto from the telescope's eyepiece. It was really awkward to aim that thing, and I had to view it at an angle because the telescope's tube was in the way – but it did work and I could see sunspots with it, which thrilled me at the time. I'll note, though, that the direct observation with these cheap (around $35) binoculars beats the pants off that telescope. Paradise ponders: orange caterpillars, finished project, shocking breakfast, surprise visitors, delicious dinner, and beautiful morning edition... Yesterday afternoon, while walking from our barn to our house, I spotted this caterpillar walking across our pavement – moving at a good clip, too! It's roughly the size of my thumb, quite large for a caterpillar. Thanks to the wonders of Google's image search, I was quickly able to identify it: it's the caterpillar of the Western Tiger Swallowtail butterfly (Papilio rutulus). More particularly, it's the caterpillar just prior to pupation – about to hibernate while it transforms into the adult butterfly. Prior to this life-cycle stage, the caterpillar is green. The Western Tiger Swallowtail is a fairly common butterfly here, and we recognized its photos immediately – but we had no idea it's caterpillar looked like that! I was walking back from the barn because I had just finished the stairs for Michelle H. I'm really pleased with how they turned out, and so is she (though so far she's only seen the photo). Michelle will be over in the next few days to do some staining and polyurethane finishing, and then I'll go over and help her install them. Hopefully they'll fit properly! Yesterday afternoon Debbie started our dinner, but it was going to take over an hour and I was hungry. I looked around for a snack and saw (a) a lovely ripe tomato, grown by Michelle H., sitting on our counter, and (b) some leftover fresh mozzarella cheese. Ah ha! A few minutes later, I had the dish at right – a little olive oil, some balsamic vinegar, and that tomato and cheese. Debbie had already eaten her share of the cheese, so I hogged this whole thing down myself. Delicious, it was! That lovely visit delayed our dinner by a few hours, and made me very glad I'd had that snack! Not long after Ben and Laura left, our kitchen was full of the enticing aroma of baking cod. Debbie had purchased two pounds of fresh cod from Macey's, and it needed to be eaten. She coated the fillets with egg and a spice mix, baked them until they practically fell apart, and then we feasted on that cod and some perfectly cooked white rice. Cod fixed that way is a favorite of both of us, and last night it was particularly good. But oh, man, were we ever stuffed! Paradise ponders: white dust, finished stairs, and WiFi meshes edition... Yesterday I did the final glue-up on the stairs I'm building for Michelle H. They're now finished except for a couple of blocks I need to fabricate to attach the stairs to her wall. I'll be headed over to her house on Tuesday or Wednesday to put them in. The first photo below shows the bottom of the stairs, and the bazillion clamps I put on for gluing two 2x4s along the bottom of all the lap joints. I did this just to keep down the bowing that will naturally occur over time. The second photo just shows the other side, which will be the top of the stairs (the photo shows the stairs assembly sitting on its back, just for convenience while gluing). I'm very pleased with how this all came out, and I'm especially pleased with how well simple lap joints (created on the router table) worked out. Stairway to ... something or other... The stairs project for Michelle H. is coming along nicely. At this point I have just one glue-up left to go (to attach the shortest stair to the other three). As you can see from the photos below, having a nice clamp collection is really important for projects like this. After that last glue-up it's just a bit of sanding, making a couple mounting braces, and we're done!